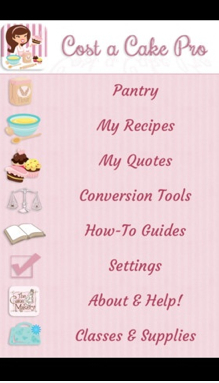 Here are the best apps for your cake decorating business and I will share some key tips and tricks to optimise your cake decorating business from your mobile device. This blog post has been in the making for a quite a while as I love decorating cakes for friends and family. I am always on the lookout for tools and apps that can help make this process a little easier (like working out what size cake to feed “x” amount of people). Having a mobile device such as a tablet, makes it a fantastic way to have your business operating from the palm of your hand. There are many options and sometimes you really have to think outside the square with the apps that are listed. 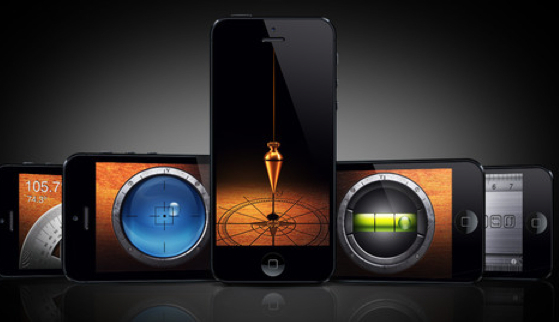 Some of these apps might work best with a stylus. Every stylus, like a good pen depends on personal taste. Don’t forget to use a photo gallery on the iPad/tablet to demonstrate your cake designs and ideas! There are three ways you can collect and curate your recipe and design ideas (what works and doesn’t work). Pinterest (http://pinterest.com/) and set up a business account as this will help you track analytics of the pins that are shared. Here is my own Pinterest board set up specifically for apps to help cake decorators with their business. Evernote (https://evernote.com/) and this is both a desktop and mobile application. Evernote is a note-taking application where you can store both audio, text and images inside one note. These notes can be stored in ‘Notebooks’ (just like folders) and can be searched for within your Evernote account. Evernote has free, premium and business accounts and currently I only use the free account. You could also set up folders for specific clients to keep track of images, designs and ideas that work. It also becomes part of your portfolio when showing future clients. There are other apps that integrate as part of Evernote (see http://trunk.evernote.com/) and are well worth a look. Dropbox (https://www.dropbox.com/). This is an online cloud storage tool and is available for both mobile and online applications. First, set up an account with Dropbox, download the app for your desktop and your mobile devices and then set up folders just like your would on your desktop computer. Many apps for Android and iOS have the capability of syncing with Dropbox and this is a very useful feature. There is a great video (Using Technology for Cake Decorating) that shows how a cake decorator uses Autodesk Sketch Book to design cakes for her clients. She does use a stylus just for precision when drawing a design. Here is a recent article detailing some great styluses to look at http://www.digitaltrends.com/mobile/best-ipad-stylus/ my personal favourite is this http://tenonedesign.com/sketchpro.php just for ease of use and comfort. There are other apps for cake decorating (that would be ideal to sketch designs such as Adobe Ideas). 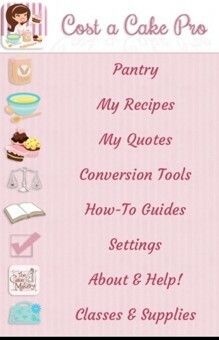 This app is a definite must for those who sell cakes and cupcakes to the general public. It is set up so that you can work out pricing from the cost of ingredients and items used to produce your cupcakes and cakes. First, you set up your pantry items that you regularly use and then build your recipes and from this you can build your quotes. Simply enter the number of servings you need, and TieredCaker will instantly tell you all of the possible tier combinations that you could stack to reach that number of servings! This app will also allow you to stack tiers one at a time with feedback on the number of servings, and even the base price of the cake. I love the fact you can email the servings guide once you have worked out your combinations. This app includes 5 tools. These are a plumb bob, the easiest way for you to verify the verticality of lines or walls (great for seeing if the side of your cake is straight). A surface level (check whether the top of your cake is flat)! The other three tools are a bubble level, a steel protractor to measure angles and a steel ruler supporting both centimeters and inches. This is one of my favourite photo editing apps for the iPad. as it has so many editing options and sharing options such as to Instagram, Facebook, Twitter and Flickr. I would use the camera connection kit or the lightning adaptor for iPad so that you can upload your photos from your camera. Google Drive has so much flexibility with the types of documents you can create. There is Google Docs (just like Word) and this gives you the flexibility to have more than one person work on the document. Google Sheet (is just like Excel) and Google Slides (is like Powerpoint). Here is some information on Google Drive and what apps are available. This is for both mobile and online use. You might also want to consider our Cake Stacker app. We believe it is the most comprehensive app to guide you through the process of designing, calculating and stacking multi-tiered, multi-shaped cakes. In just a few easy steps you can build and view a 3D Preview of your desired cake for required servings and a portion size including dowels placement guide and fondant quantity required for each tier. It is available on Apple, Android, Amazon and Blackberry app stores. Is that the “cake stacker” app from baking it. http://cakestacker.bakingit.com? I’d totally agree with this. I use their whole website in general and it’s a real time saving tool.